Cancer, the uncontrolled growth of abnormal cells in the body, is a general term used to account for more than 100 types of disease. According to Cancer Facts and Figures 2015, published by the American Cancer Society, nearly 600,000 U.S. residents will be lost to cancer by the end of this year. This calculates to approximately 1 out of every 4 deaths. Global spending on cancer medications to combat each particular disease continues to increase, and for the first time crossed the $100 billion level in 2014. The primary focus of the pharmaceutical industry continues to be oncology, where 50% of drugs in development were for cancer indications. While concerted efforts to discover new anticancer drugs continue, this has not translated into high levels of success for potential new drugs, with up to 95% of candidate molecules failing clinical trials due to lack of efficacy or unforeseen safety concerns. These shortcomings are in part the result of in vitro cell-based assay models that do not represent in vivo conditions. As an example, cells grown on two-dimensional (2D) hard plastic or glass substrates are easily prepared, but may not be representative of the true in vivo cell environment. In this format, extracellular matrix (ECM) components, cell-to-cell and cell-to-matrix interactions that are important for differentiation, proliferation, and cellular functions in vivo are lost. Three-dimensional (3D) cell culture methods, in comparison, provide a matrix that encourages cells to organize into structures more indicative of the in vivo environment, thereby developing normal cell-cell and cell-ECM interactions in an in vitro environment. The favorable environment created by the 3D culture model also allows for longer-term dosing experiments that analyze a potential drug’s cumulative effects. Even as 3D cell culture methods bring about the hope of lowering lead molecule attrition rates, they also bring new challenges, particularly for assay readout systems. For example, cells aggregated into spheroid structures, which are much smaller than the area of the well of a 96-well microtiter plate are particularly challenging to monitor with conventional PMT-based detection used in microplate readers. Microscopy is a better solution for spheroids where high powered microscope objectives can reduce the field of view to only the spheroid and thus improve assay performance. However, in other 3D systems that encompass the whole microplate well such as scaffold-based 3D cell culture methods, PMT-based detection, which is designed to collect as much light as possible from a microplate well may provide better assay performance. The Cytation™ Cell Imaging Multi-Mode Reader combines automated digital widefield microscopy with conventional multimode microplate reading in a single system suitable for most types of 3D cell culture models. In the case studies below, Cytation’s PMT- and CCD-based detection capabilities demonstrate the unique flexibility of the reader to provide the assay performance required for a wide range of 3D cell culture studies. Live cell assays provide valuable information that may be missed in a single time point, lytic assay. In this format, cells are pre-incubated with a probe that will exhibit a change in signal over time in the proper conditions. In this case, 3D spheroids were incubated with a fluorogenic hypoxia probe, followed by kinetic monitoring during an 11 hour exposure to hypoxic conditions. During that time whole well monochromator-based reading and microscopic imaging using a 4x and a 10× objective was carried out. When examining the microplate reading results (Figure 1A), no significant change in fluorescent values was seen during the 11 hour time period. The reason for this phenomenon is that the area of a liver microtissue is approximately 1,000× smaller than the area of the well of a 96-well microtiter plate. PMT-based optics are designed to capture as much light from the well as possible, thus for live cell microtissue analysis, these optics collect largely background. From the mean fluorescence values calculated from 4× and 10× images, it is evident that being able to focus on a smaller portion of the well containing the sample of interest creates a more robust analysis of the change in signal from the hypoxia reagent. This is further confirmed when performing cellular analysis on the 10× images. Established parameters allow the Gen5™ Data Analysis Software to define object masks around the liver microtissue (Figures 1B–1E). By eliminating all superfluous areas of the image, only the signal emanating from the microtissue is measured, creating the largest change in fluorescent signal, and therefore most robust method to analyze the date from the experiment. Figure 1. (A) Hypoxia reagent fluorescent signal fold-change analysis. (B–E) Gen5 cellular analysis object masks drawn around 10× microtissue images after 0, 3, 6, and 11 hour incubations, respectively. 3D spheroids composed of co-cultured cancer and stromal cells, embedded in a matrix of basement membrane proteins, have become the preferred method to determine the antimetastatic capabilities of test molecules. Cells invade away from the original spheroid structure into the matrix in response to chemoattractants, while the opposite is true in the presence of the appropriate inhibitor. Because this process takes place on a microscopic level, and often incorporates non-labeled cells, imaging is the preferred method to properly track invasion over the incubation period (Figure 2A). With the addition of cellular analysis (Figure 2B), a detailed object mask can be placed around the invading structure enabling accurate tracking of the changes in spheroid area. Figure 2. (A) A 4× brightfield z-projected image of 3D tumor invasion following 5 day incubation. (B) Cellular analysis object mask drawn around invading cells and invadopodia. Cancers often involve aberrant signaling pathways, so drug discovery studies often target specific nodes of signaling pathways. These target-based approaches are most physiologically relevant when in vitro expression levels of enzymes involved in the signaling pathway mimic what is seen in vivo. 3D cell culture systems are most capable of creating this phenomenon (Figures 3A & 3B). Many assay chemistries have been developed to quantify the activity of these enzymes and readouts are primarily designed for PMT-based detection. Consequently, scaffold-based 3D cell culture systems prove most applicable. 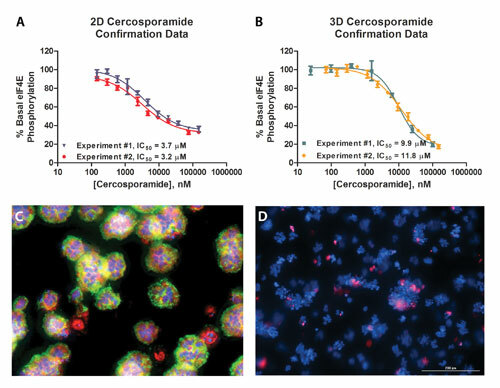 Furthermore, the imaging capabilities of Cytation can be used to assess any cytotoxicity of inhibiting compounds that may influence potency estimation (Figures 3C & 3D). Figure 3. (A & B) phospho-eIF4E assay cercosporamide pharmacology comparison using 2D and 3D cultured cells. (C) A 20× image of HCT116 tumoroid structures. (D) A 10× image of live/dead assay performed following compound incubation. Cytation provides the ability to generate robust results from a wide variety of 3D cellular structures. PMT-based optics allow detection of optimized target-based assays, while automated digital microscopy enables phenotypic live cell assays especially with smaller 3D structures such as spheroids. Brad Larson (larsonb@biotek.com) is principal scientist at Biotek.